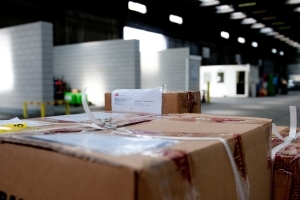 Arrange customs formalities Rotterdam - Mainport Warehousing B.V.
Mainport is AEO certified and may therefore arrange customs formalities at the port of Rotterdam. It means that we are allowed to issue customs documentation without the intervention of Dutch customs officers. That means that the clearance of your cargo will be done a lot faster. Combined with extensive resources your cargo is forwarded in a highly efficient manner. No inspection on criteria which have already been checked. Due to this certification Mainport is able to arrange customs formalities in Rotterdam and all other ports in countries that are part of the European Union. Would you like Mainport to arrange customs formalities for your vessels in Rotterdam or elsewhere? Contact Mainport and inform us on what you are expecting. Our devoted staff is more than capable to answer any questions you might have. Reach us by calling at +31 (0)10 495 4360.